Benoath Cove is tucked around a headland from it’s main access at Bossiney Haven. It’s beach is usually under the waves, but on a low spring tide rocky cave pierced cliffs are like heaven to me! I was there in mid-March on one of the lowest tides of the year which gave me four hours to explore and photograph. This blog post represents my sketchbook or work-in-progress as I haven’t made a finished image at the time of posting; that will have to wait until a rainy day. However my working practice includes making iPhone photo-constructions on location and I like to process my RAW images asap and then make quick, automated, photomerges from the jpegs produced. Quick automated photomerge in Photoshop CC 2015. Making a sketch like this helps me to progress the image later on; I’m immediately wanting to lengthen the exposure of many of the darker frames to expand the overall tonal range and I also need to delicately bring out the water drips which give a sense of both the dampness and of time passing. I timed my visit to Benoath so that I was there two hours before low tide and took the less used, old path, down to the beach. This path isn’t way-marked and I wouldn’t recommend it; the first part was covered in brambles which are only bearable in the winter when they’ve died back and heavy jeans are worn, the second part, the decent down the cliff, is treacherous as most of it is on a steep ledge with only a rail to keep you from plunging to the beach. The last section has no handrail and just an old fishing rope, tied to the end of the rail, to help you over the steep, wet, smooth, slippery rocks onto to equally difficult beach below. I had been on the beach in the past but it was disorientating with the sea still so far in, so it took a few minutes of clambering up and down the so far accessible rocky beach, before I could find the cave I was looking for. 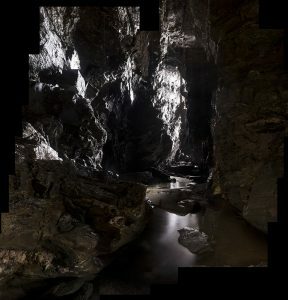 I refer to this cave as Signal Cave because you can actually make a mobile phone call inside. I even received a text right at the very back which has to be at least 30 metre from the opening. 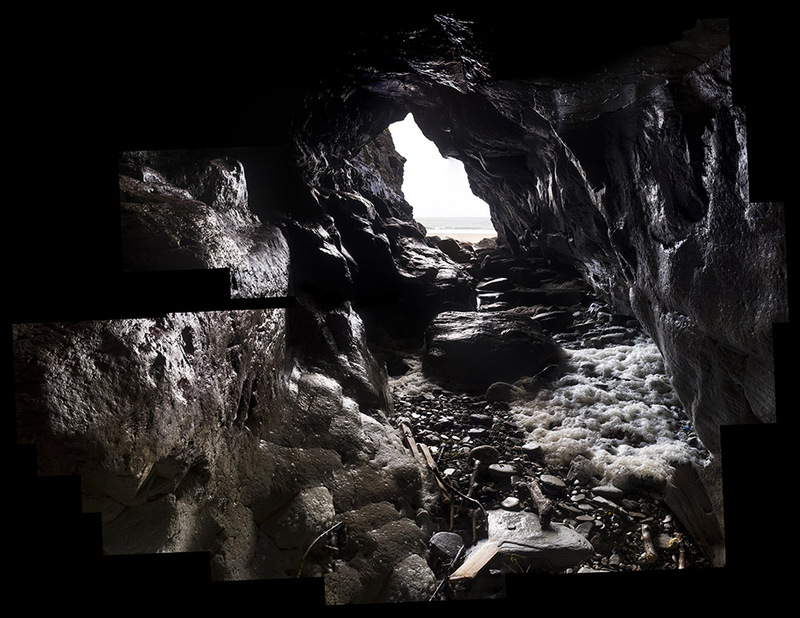 My reason for getting into the cave as soon as possible after the receding tide was aesthetic, the wet walls and dripping ceiling make for a far more dramatic image. 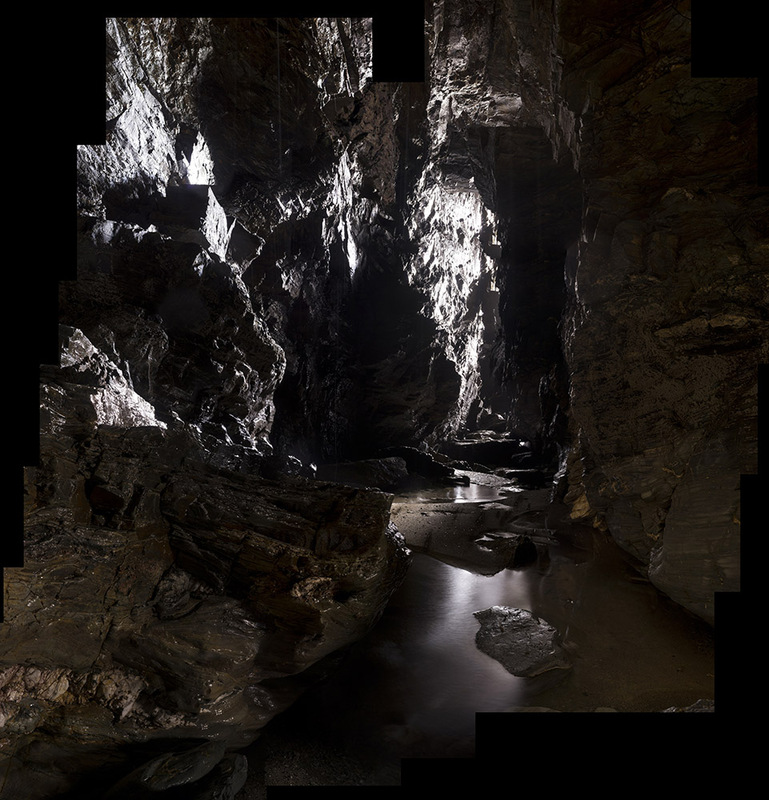 This particular cave is my current favourite and I could easily have spent all four hours here, as it has three distinct entrances which all join together far into the the cliff. It takes me approximately an hour to shoot the frames for a single constructed photograph so four hours was never going to be enough on this beach as it was visually so generous. It takes me approximately an hour to shoot the frames for a single constructed photograph so four hours was never going to be enough on this beach as it was visually so generous. These last two iPhone AutoStich images will have to wait to photographed properly! The first I entered with only a few minutes before low tide, which was lapping at it’s mouth, and I had to force myself to leave it for another day (I know how obsessive I can be to perfect the image, I knew I would be so absorbed in my work that time would disappear and I could be cut off, inside the cave!). I’m working on totally revamping my website so please be patient for a few days – It will be fully working very soon! 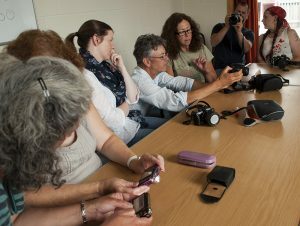 A ‘sit around the table’ workshop to get to know your camera better. You’ll learn about shutter speeds, aperture, ISO, flash and setting your camera up for optimum quality. A practical workshop to learn how to use your iPhone’s camera to take professional looking photographs and enhance those images on the go. Suitable for anyone with an iPhone. You will need to install a few cheap photo apps in advance which I’ll advise on when booking! Photographing your own Artwork – Friday 1st July in Bideford, (11am-6pm) £60 with lunch, tea and coffee provided! Introduction to Photoshop – Thursday 7th July in Bideford (10am–5pm) – £60 with lunch, tea and coffee provided!